EU countries are a favourite subject on Russian state TV. Every evening, the ‘gospel’ is watched for hours on end by millions in Russia, but also by Russian-speaking people in Eastern Europe, the Baltic countries, Scandinavia and the Caucasus. For three and a half years, NGO Ukraine Crisis Media Centre (UCMC) monitored the most popular daily news bulletins and talk shows on Channel One, NTV and Russia-1. Monitored content was converted into text in real time and automatically filtered by keywords. The filtered data was then ordered by algorithms into categories on a positive-neutral-negative scale. The result (a total of 22,711 negative mentions) revealed a set of recurring narratives depicting Europe as a decaying, insecure place plagued with protests, terrorism and refugees. You can find the UCMC study for the Estonian Centre for Eastern Partnership here. While most of the time Europe as a whole is the overarching theme, several countries enjoy most of the attention. 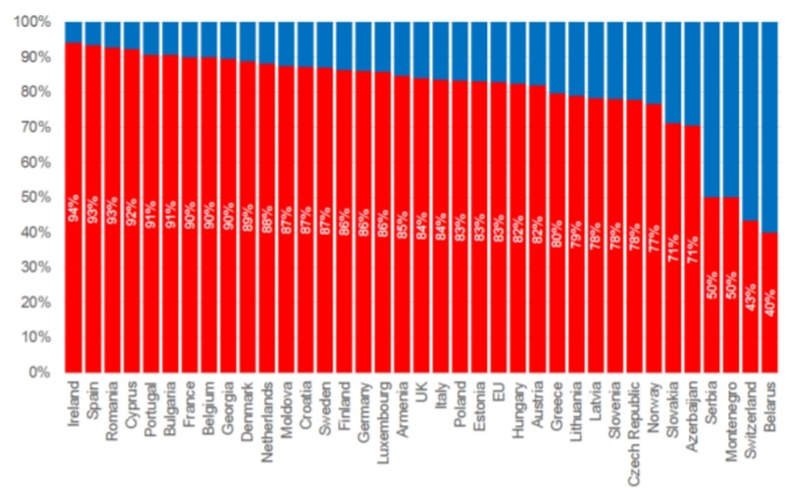 With 17% of all negative coverage, France takes the first prize as the most talked about, followed closely by Germany and the UK (coincidentally the three most populated EU member states). Russian TV show hosts and panellists tirelessly focus on a number of very specific recurrent themes. Almost half of the Euro-bashing time is spent detailing the ‘horrors of life’ and the ‘moral decay’ that the continent is allegedly ridden with. When they do change the subject, the choice is limited to just a handful of other issues: protests, terrorism, refugees and sanctions. 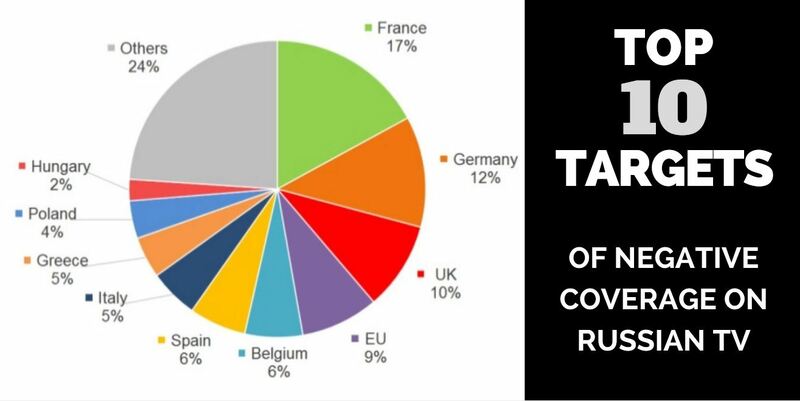 Regarding the coverage on Russian TV about the Nordic countries, the NATO StraCom COE has similar findings: The most common narratives in relation to the Nordic countries were that refugees and migrants are a destabilising factor. Admittedly, some of the most favoured topics according to UCMC are inspired by realities Europe has been confronted with in the last few years. However, it is the angle that matters. Reporting and analysis seem to be most often fact-free. Instead, viewers are served large portions of ready-made interpretation. On average, nearly nine times out of ten, the theme is hijacked and presented with a negative spin. While the six ‘super-narratives’ are consistent across the board, not all countries are treated equally. When France is in their sight, Russian TV hosts are inclined to portray it as constantly shaken by terrorist attacks, massive protests or simply as a dangerous, unstable place to live. For the Caucasus countries, as well as Moldova and Belarus, two extra colours are added to the palette – looming military conflicts and Russia as the ‘protecting elder brother‘. In the same shows, Nazism is purportedly making a comeback in the Baltic countries, Baltic Russian-speaking populations have limited access to basic rights and Soviet history is subject to revision. Norway and Finland apparently steal Russian children, and moral values in Sweden are eroded by gender equality.